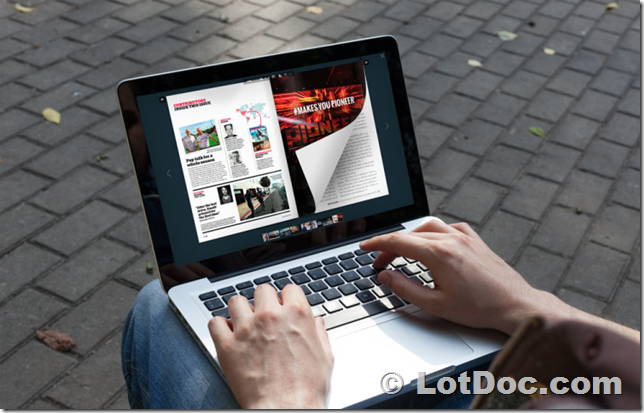 HTML5 Flip Book Maker – Convert Adobe PDF to html5 flipping book with page-turning effect! Use HTML5 Flip Book Maker to create and publish flip books and create eBooks, magazines, brochures, and catalogs, etc. Your First Choice to Make Digital Flip Book! HTML5 Flip book Maker can convert PDF to page flip ebook that can be viewed on Windows PC, Mac, iPad, iPhone and other mobile devices. It supports input formats PDF, Office files (Word, Excel, PowerPoint, etc.). You can use this Cloud Web App to create flipbooks online, and directly publish the flipbooks online on HTML5 Cloud servers. PDF file is not the first choice to make digital publications anymore! HTML5 is the very program that helps create digital page flip ebook that not only brings fantastic reading experience, but can be widely distributed with various publishing methods. HTML5 is a professional PDF to Html5 flipbook converter that supports many different kinds of conversions. With the use of the program, you may customize your own exclusive eBooks, magazines, brochures, and catalogs that reaches a wide range of viewers. When you have online published your flipbook, people can intuitively view the pages with amazing page flipping effect instead of having it downloaded first as PDF files. Besides, you are allowed to add various rich media to your digital brochure which will engage much more viewers than the monotonous PDF files. 4: Impress everyone with a professional look! OK, Publish your first Flipbook now!